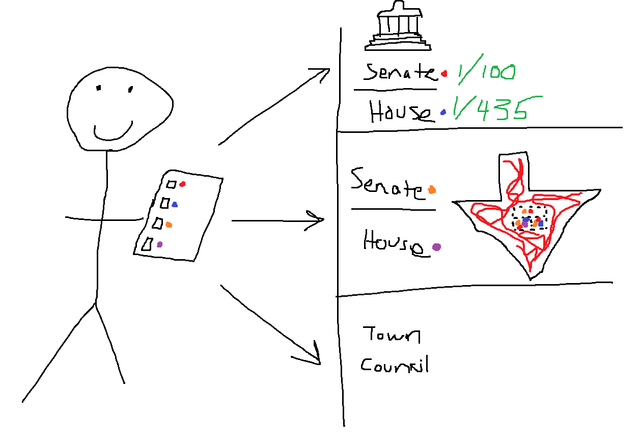 Elections in the USA: ExplainedsteemCreated with Sketch. This is a new mini-series I'm trying out. I think Steemit is the perfect place to publish this, since there are so many people on here from all over the world. I started off with tipping explained, which you can read here and then I went on to cover health care. Today, I'm going to cover our elections, specifically the mid-term elections. Why? Because we have one tomorrow! People in the United States vote for a new president once every 4 years. Our last presidential election was in 2016, and our next one will be in 2020. However, there are many other elected positions both at the national, state, and local level. Elections for these positions do not all follow the same cycle. For example, Senators (those who serve in our legislation's upper house) serve 6 year terms. Representatives (those who serve in our legislation's lower house) serve 2 year terms. So in 2016, a third of our senators were up for re-election, and all 435 of our representatives were as well. Every two years the United States holds national elections. 2018 is one of these years, but our president is not up for re-election. So for that reason, we call it a "mid-term" election (because it is in the middle of his term). Tomorrow, another 33 Senators are up for re-election, as well as every single Representative. At the state and local level, people will also be voting for state senators, state representatives, governors (in 36 out of 50 states), town councils, and mayors. This will vary from person to person. But make no mistake, mid-term elections are still a pretty big deal even if no president is on the ballot! To grossly over-simplify things, government in the United States looks like this. You have a legislative branch (with two houses), an executive branch, and a judicial branch, and this same triangle is more or less mirrored at the state level and then again at the local (county, town, or city) level. Because of the system of checks and balances in the United States, controlling all the branches of government makes it much easier to pass legislation or basically do anything significant at all. For the past two years, Donald Trump (a Republican) has been president, and the Republican Party has also held a majority in both the Senate (upper house) and House of Representatives (lower house). This has created an environment where the Republicans have been able to basically do as they pleased, much to the chagrin of the Democrats (the other major party). The Supreme Court (the final branch) has 9 judges, and 5 out of 9 of them were appointed by Republicans, so for all intents and purposes Republicans "hold" that branch. Although a fun joke we all like to tell each other in the Untied States is that the Supreme Court is not political. But I digress. Believe it or not, the Democrats stand a better chance of gaining a majority in the House than in the Senate. But taking control of either body will finally give the Democrats enough power to put the brakes on the Republican party's agenda. Every resident of a state will vote for the same Senator. From there, depending on the district, they will have different races for national Representative and state Senator and Representative. I tried to color code it to make it a little easier to understand. But the bottom line is that no one person is going to be able to tip the scales in any meaningful way. Remember, there are 435 national House races playing out in 435 different districts. Many of these districts collectively voted for Trump and a Republican representative in 2016. However, Democrats (and Republicans and pollsters) believe that enough of these districts (about 27 of them) have soured on Trump to the point where they will now elect a Democrat as their representative. If 25 of these races go to Democrats, then control of the House will flip from Republican to Democrat. 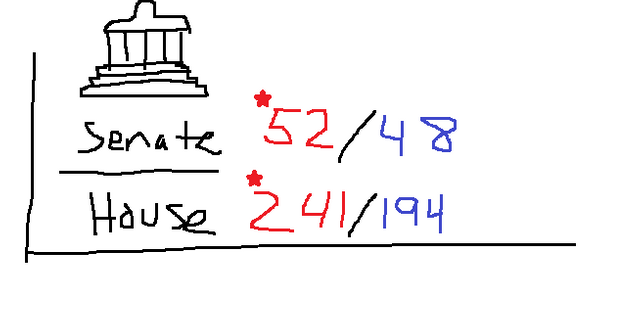 The picture in the Senate is a lot worse, mostly due to bad luck regarding which senators are "up" for re-election. About two-thirds of them are Democrats, and the Republicans that are up for re-election are in mostly safe races they are expected to comfortably win (like Ted Cruz in Texas). So the path to control of the Senate, while short at only 3 pickups needed, is widely seen as unlikely to happen. However, if Democrats do pull it off (and that is a possibility! ), that will be a huge win for their party and will severely hamper Trump's remaining two years in office. Either legislative house flipping to Democrat control will be disastrous for Republicans. That's why tomorrow's race is such a big deal. If you are registered to vote, you have an assigned polling place. Some states send ballots in the mail, but most people will show up in person at their polling place to cast their ballots. Most of these are municipal buildings like fire stations and schools (incidentally, schools are generally closed on election day). You check in at the front desk where a volunteer verifies that you're eligible to vote and you get your ballot. You go into a booth and mark your choices, then drop it off into a machine. The winner of each race is the candidate with the highest number of votes. Most races will be between two candidates: a Republican and a Democrat. However, there are some races with 3 or 4 candidates, although these "third party" candidates rarely ever win, especially at the national level. You can also write in candidates, or leave that position blank on your ballot. Because of this, it's possible for Senators and Representatives to be elected with less than 50% of the vote, and in fact this happens quite often. The system is structured in a way that reinforces our "two party" system where essentially the entire Congress is made up of either Republicans and Democrats. Even though President Trump is not up for re-election, the future of his remaining 2 years in office will hinge directly on whether or not Republicans can keep control of both the House and the Senate. If they lose the House (the most likely scenario), they will not be able to pass any additional legislation without securing at least a few Democrat votes. The House also has subpoena power to initiate investigations as well as the ability to vote to impeach (remove) the president, so Democrats could do that as well, which would really ruin Trump's next 2 years. @DollarsAndSense is a father, veteran, participant in the rat race, freelance writer, and volunteer EMT. Want to read other parts of this series? Unless otherwise noted, all text and pictures in this post are my own and may not be reused without my permission. Awesome, and I mean that. You actually did a better job of explaining this than the class I had to take in high school about government and politics. I do sincerely hope this will help others from both the US and elsewhere understand how this is supposed to work so thank you for writing this up and sharing. Thank you for that! I was always confused by the way reporters explained the elections but now I understand them so much better! The results should be interesting either way. I upvoted your contribution because to my mind your post is at least 7 SBD worth and should receive 121 votes. It's now up to the lovely Steemit community to make this come true. Your UA account score is currently 2.914 which ranks you at #11192 across all Steem accounts. Your rank has dropped 4 places in the last three days (old rank 11188). In our last Algorithmic Curation Round, consisting of 243 contributions, your post is ranked at #117. The Congress isn't a winner take all institution. There are substantive protections for minority opinions. Many votes require a 3/5 or 2/3rds majority. BTW: The parties aren't in the Constitution. The US Founders had the notion that elected officials would represent the people and not represent a party. The US Founders would loath the fact that mid term elections seem to be about which faction controls the Congress. The stupid parties really hurt this nation. What is really amazing is that the partisan divide is getting deeper when the positions of the parties aren't that far apart. Trump has a long history of jumping between parties. His positions on most issues are closer to the traditional Democratic views than the traditional Republican view. aw, you should have submitted your map of america to the contest I like your cartoons they make me smile. howdy dollarsandsense! great job on this explanation, love the map. . especially the Texas outline. lol. I'm honored! lol. It gave some levity to a serious subject too. Well, at least to some of us it's a serious subject.